This project consists of books that build blocks of color. I’m not interested in the content of these books. The color of their bindings is what attracts me. I am making a painting using books as the medium and source of color. This introduces the question: Where do books belong in the age of increasing new technologies? It also addresses the issue of our decrease in owning physical books. With this installation, I intend to reincarnate these books as a colorfield painting, breathing new life into them. Reusing and repurposing these items that have been thrown away, discarded as cumbersome or obsolete, and weaving them into art for viewing pleasure again. 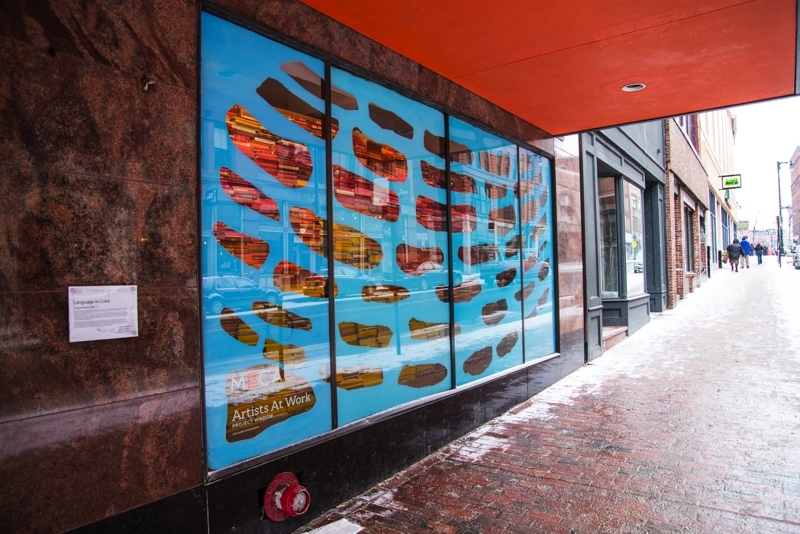 This work was installed for 6 weeks in 2013 at Maine College of Art. The title of this work Anacamptic, comes from a Greek musical term meaning “the name to sounds produced by reflection as in echoes.” The sound composed for this piece is 40 minutes long and consists of two voices, an alto and soprano, each singing 4 notes. In the right speaker is the alto voice pointed at and “reflecting” off of the painting. In the left speaker is the soprano voice operating the same way. The alto notes sung are C, C#, D#, E and the soprano notes are C#, D#, E, and F. Each note corresponds to a color according to their frequency and wavelength measurements. These colors are applied to the paintings. The use of color and application of the paint applies to the pitch in terms of the tone, volume, and density. Both the sound and the paintings are collaborators. At times they mirror each other; at other times they stand as separate modes existing in the same space. One, alto voice is warm and round; the other, soprano voice is cool and thin. In the color log, time is indicated by the record of the many colors that exist in each painting; all variations on (alto) orange, red, blue, green and (soprano) orange, green, blue, and indigo. This workmirrors the reflection of light and sky on the windows across from my studio window. The voice and the paintings affirm my observations and perceptions in terms of light and time. 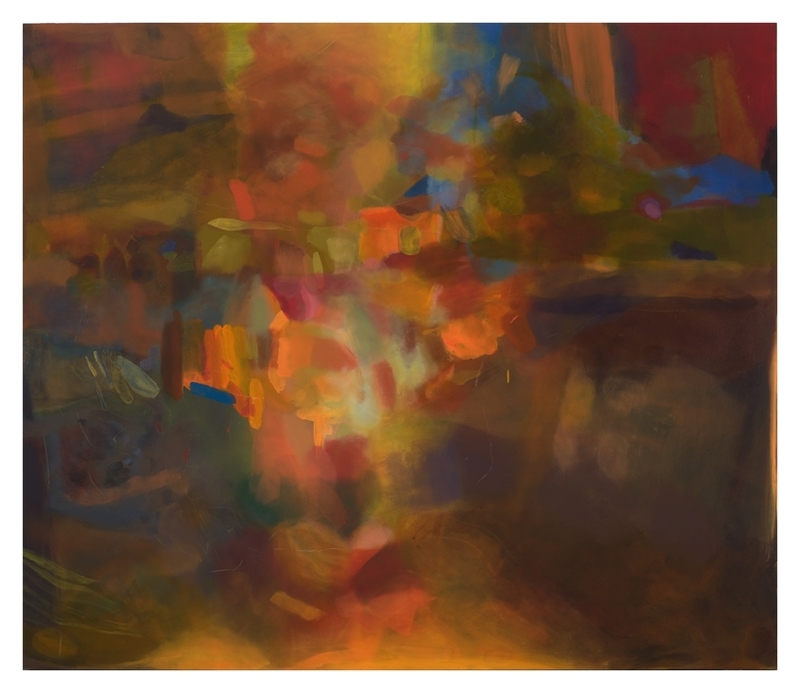 The sound is the light to the painting, amplifying the surface and describing it. There is a subtle illusion of depth in the atmospheric space of the paintings, but at the same time a flat space reconstituting the surface of the canvas. The ambiguity lies in whether the eye is seeing out a window, looking into a window, or being reflected on the outside of it. Contained glossy areas of the paint reflect the body as it moves past the surface. Light at different times of day affects the appearance of the paintings. One could watch the color shift as the sun goes down while listening through the duration of the sound piece.